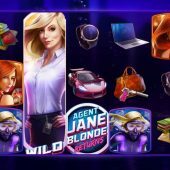 Agent Jane Blonde Returns slot by Microgaming she's back again! 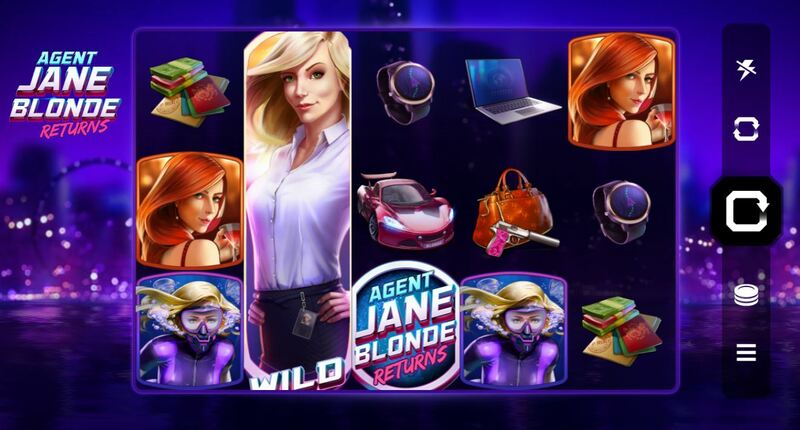 Agent Jane Blonde Returns slot by Microgaming has been developed by in-house studio Stormcraft and I would suggest you must have heard of the original game, simply titled Agent Jane Blonde. This was one of a several 9-line games with the same mechanic which also included Spring Break, Thunderstruck and Ladies Nite and are considered classics by some players. The theme as before is a female 007-type character who we see here in her various guises with the reels set over a night time city background and some urgent adventure music as we spin. Will Jane prove successful in her mission to increase our bankroll or will the villains win out for a change? A clue to the lower volatility is immediate by the fact Agent Jane Blonde Returns slot has 15 paying lines over 5 reels of 3 rows and I must be honest right from this point, that's only the beginning of the numerous negatives here. The symbols are single with stacked Wilds on all reels and these pay 20x bet for 5-of-a-kind so there's another negative. The rest of the pays are 12x for Jane in her evening dress or hat and glasses, 10x in her diving suit or catsuit, 3x for the Handbag, Car or Passports and finally 2x for either the Laptop or Wristwatch. There are logo scatters on all reels but really, don't get too excited yet. If you see 2 scatters appear anywhere in view, the reels darken and they turn to sticky Wilds. The remaining positions respin until no further Wilds are added, or all 15 positions are filled, at which point you'd get the astronomical 300x bet maximum pay.